Hello all! It's FALL! One of my favorite times of the year! 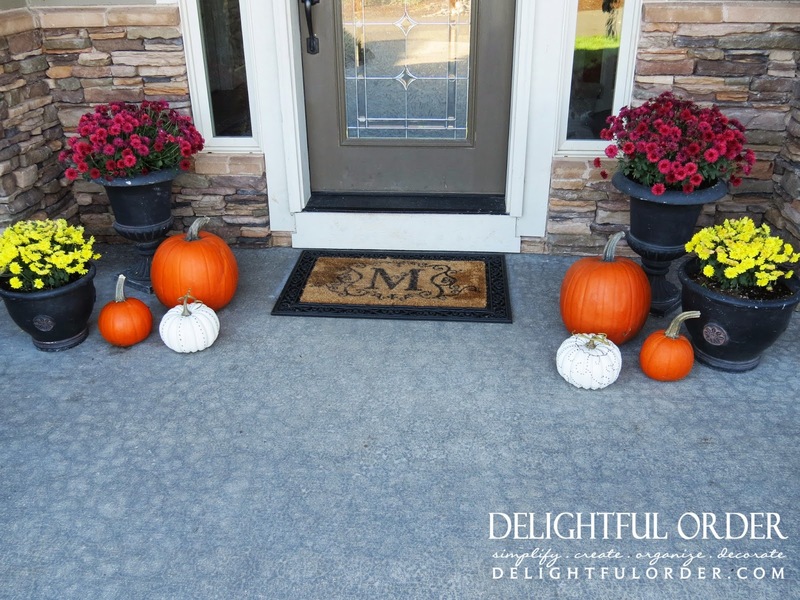 Last week I spent some time sprucing up my front porch for fall. I added a wreath, a few mums to my pots, plopped down some pumpkins and voila.. 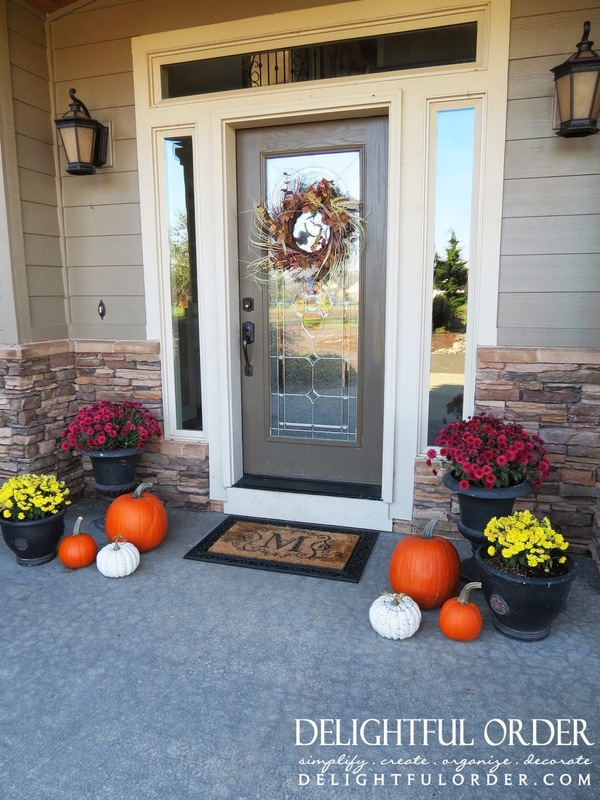 I turned it into a festive fall-ish front porch. I scored this adorable wreath at Joann Fabrics for 50% off. I had an additional 20% off of that, so I was pumped! 70% off, yes I think I'll take it. A few weeks back I found this mat at Bed, Bath & Beyond and I LOVE it! The middle section can be replaced too. I love adding a little color to the porch. .. and the white ones are fake. I showed you how I spray painted them and added a little glitter to them in this post here. ... and I totally LOVE them. 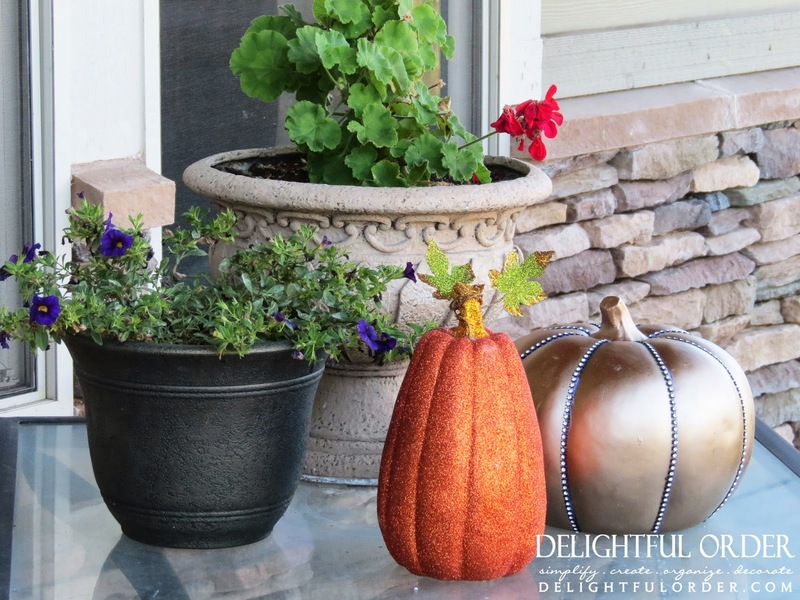 There you have it, my Front Porch Fall Decor. 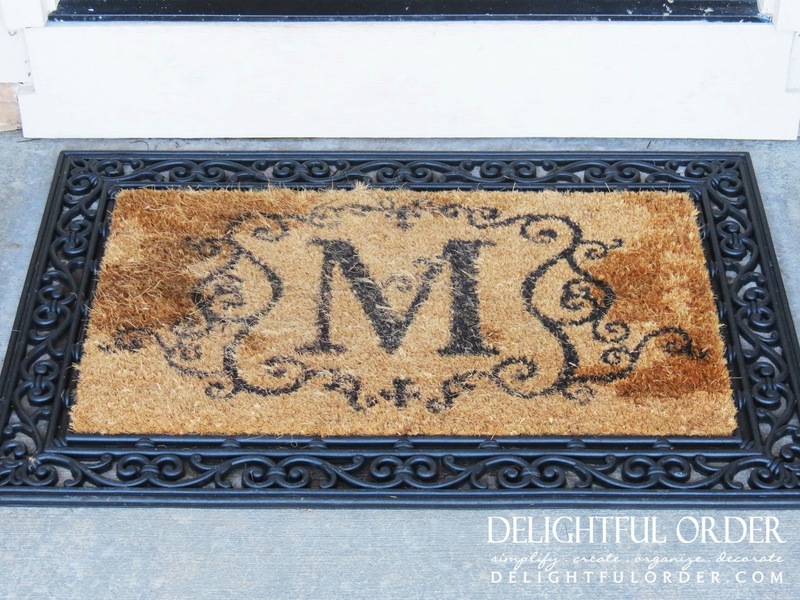 Remember to vote for Delightful Order each day for the Top 25 Home Management Moms! 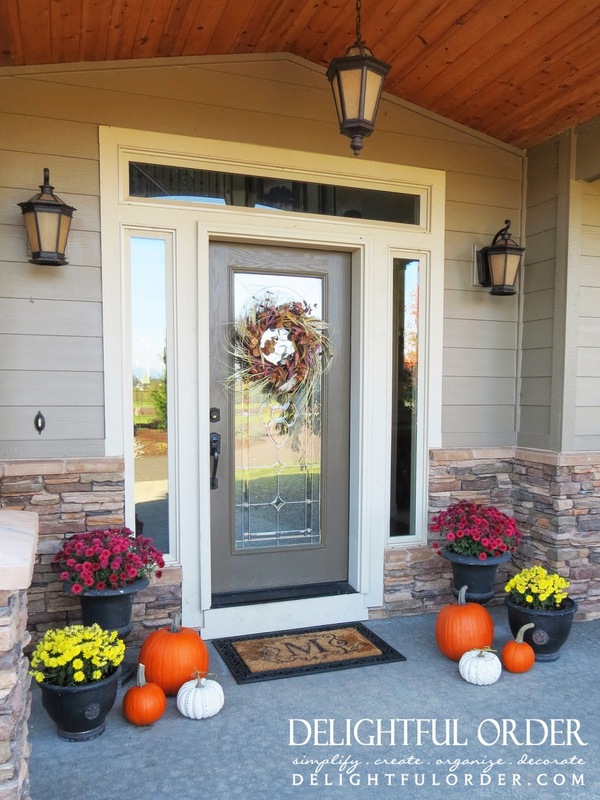 The front porch looks great and I love that wreath!! 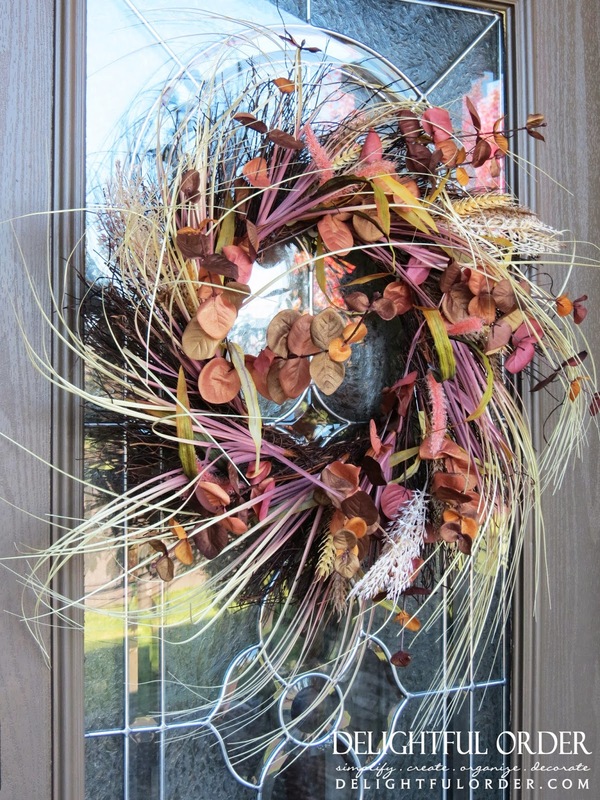 Hi, I like that wreath, it is beautiful. I love the rest, too, but wouldn't arrange everything in such a strict symmetrical order. I have a pumpkin on one side of our door and fall flowers on the other side. I'm afraid I haven't found a wreath that I liked yet. And I cannot do that myself. Very nice! Looks so pretty and colorful! Great job! It looks GREAT!!!! Fabulous job. This is just a gorgeous front porch! LOVE IT!